Netanyahu sells leavened goods to a non-Jew ahead of Passover, after intervention by Chief Rabbi Lau. The Chief Rabbis of Israel, Ashkenazic Chief Rabbi David Lau and Sephardic Chief Rabbi Yitzhak Yosef, oversaw the sale to a non-Jew of all of the chametz - leavened foodstuffs - of the Jewish state of Israel on Thursday ahead of Pesach (Passover). The transfer was sealed by the signature of Prime Minister Binyamin Netanyau, who signed it under the authority of his role as acting finance minister until the new government coalesces. The sale took place at the Prime Minister's Office in Jerusalem. A mere two days after elections, Rabbi Lau contacted Cabinet Secretary Avichai Mandelblit, urging him to ensure the sale of chametz would proceed uninterrupted by the snap elections, which came after then-Finance Minister Yair Lapid was fired from the coalition along with Tzipi Livni. Rabbi Lau pointed out that since there was no acting finance minister at the time, there would be no qualified official to stand in for the state and sell its chametz to a non-Jew as required by law. With no finance minister in office, Rabbi Lau asked Mandelblit to give the Chief Rabbis the authority to sell the chametz for the state of Israel. But this Sunday the government decided to appoint Netanyahu to fill the void by leading all governmental ministries left without a minister for the remainder of the current government in its transitional phase until a new coalition is formed. 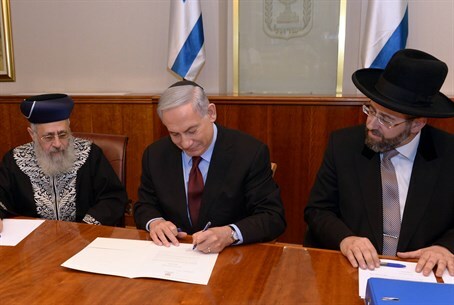 The bill of sale signed by Netanyahu can be viewed below.